It’s one of the great trials of a reader’s life: the fact that whenever you settle down with a good book, it seems like someone needs you or has a question or—of all things—decides it’s the perfect moment to chat with you. 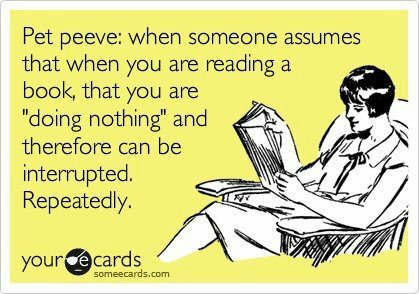 As someone who’s dealt with this particular problem many times, I have several suggestions for how to have an interruption-free reading time. One: Wear a disguise. This is particularly useful if you’re trying to remain undisturbed by family members. They might wonder why there’s a random person with a wig, sunglasses, and plastic hillbilly teeth in their living room, but hopefully they’ll be too afraid to ask questions. 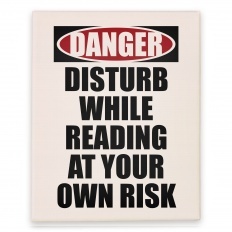 Two: Put up a warning sign of some sort. Feel free to include actual consequences, and don’t forget to follow through if people disregard it. After all, you can’t risk your reputation by making empty threats. Besides, if they ignore your warning sign today, they might start ignoring One-Way street signs and Toxic Waste alerts next, and it’s all downhill from there. You’re doing them a favor. Three: Hide. There are different levels to this skill depending on how engaging the book is and how desperate you are to find a truly secure location to finish it. Beginner: You can still be found if needed, but you’re in an out-of-the-way location. This level includes reading in the laundry room, behind a tree in the backyard, or in the bathroom. Intermediate: At this level, you really don’t want to be discovered, though you might keep your cell phone with you in case you need to be contacted for an emergency. This is the flashlight-in-the-basement-storage-room stage. It can also include fleeing to an off-site location, like the local library or a coffeeshop. Or, even more cleverly, the grocery store so you can pretend like you’re running errands at the same time. I’ve written a few posts that deal with the behind-the-scenes of what goes on at Bethany House, but I know many of you are also interested in a sneak peek at the actual writing process. For that, I have to turn to my authors, and this month we have something extra-special: two critique partners with novels releasing the same month! 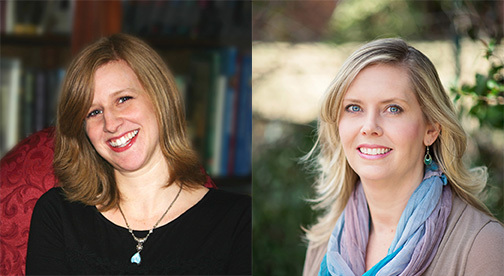 I asked Roseanna White and Dina Sleiman to share a bit of their revising process with us. That’s Roseanna on the left, Dina on the right. Thanks so much for joining us, ladies! Amy: What does being a critique partner involve? How do you and Dina manage the process? Roseanna: Critiquing is the process of giving advice on your partner’s work—sometimes feedback on the overall concept, brainstorming, what works and doesn’t, lines that are confusing, and so on. Our critiquing has varied over the years based on what we need at a given time. Recently, we’ve sent each other complete manuscripts; we then read and provide comments in the document, replying via email. Dina and I don’t critique every book for each other, but we’ve done quite a few together over the years. Amy: When did you and Roseanna become critique partners, and how did that happen? Dina: I didn’t get involved in writers’ circles until 2009, and I quickly discovered that many writers had these wonderful people in their lives called critique partners. For a while I kind of sat back and checked out a number of women in my European historical writers group. Roseanna was one of the writers who I admired and thought might be a good fit for me. Then in early 2010 we were both working on projects with Muslim characters, and we decided to try critiquing for each other. As I suspected, it was an awesome arrangement! And since Roseanna was a little further ahead in her writing journey than me, I learned so much just by studying how she did things. Amy: Why would you say having a critique partner or group is valuable? Roseanna: Oh my—sometimes we just need that step-removed perspective! Often we know something’s off in our story but can’t quite identify what. Other times we think it’s right on, but we want to make sure…and there’s usually something that doesn’t strike readers quite the way we hoped. Plus when you add in another writer’s take on everything from craft to plot to fine points of history, they always catch things you’ve missed or that you just didn’t know. Dina: Critique partners catch so many problems that a writer just doesn’t have the perspective to see. For example, often a writer knows some pertinent information, but they don’t remember to put it down on the page or they don’t describe it in a way that is clear to the reader. I now have a variety of critiquers that have different fortes. Some are good at big picture elements, some are good at scene development, and some focus on details. And of course now I have my wonderful Bethany House editors as well. 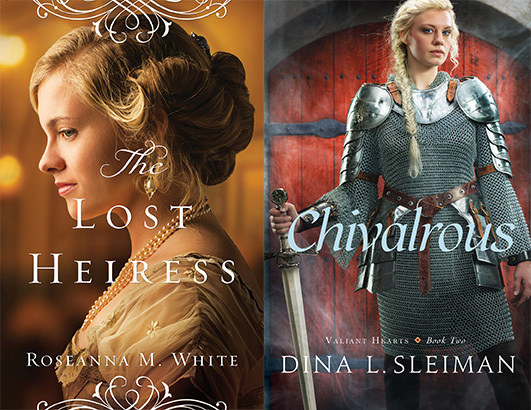 And their September releases, The Lost Heiress and Chivalrous. Ask Bethany House: Where Did You Get Your Name? This question takes us back to the early days of Bethany House. In 1956, when BHP began, it was part of a larger missions organization called Bethany Fellowship, an organization dedicated to training and supporting missionaries. Printing books became one of the ways they funded international missions, along with donations and various other business endeavors. As of today, this novel has sold more than a million copies! 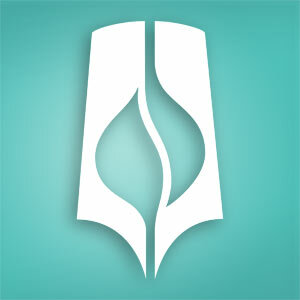 In 2003, Bethany Fellowship sold Bethany House Publishers, and we became a part of the Baker Publishing Company family. Of course, it wouldn’t make sense to change our name. So even though it can get confusing to people living nearby (Bethany International, Bethany Church, and Bethany Global University, a college training young people for ministry, are all our neighbors, even though we are no longer officially connected to them), we still proudly have the name Bethany House. If you didn’t realize this was an inkpen quill, don’t worry…it took me a full year working here to make the connection. Fun side-note on names: Remember the first Bethany House fiction book, Love Comes Softly? The editor who acquired that novel and hundreds of others through the years was Carol Johnson. She and her husband Gary led Bethany House’s editorial team for many years. Carol was instrumental in starting up the Christy Awards to recognize Christian fiction authors, and the American Christian Fiction Writers honored her recently by changing their fiction award to the Carol Awards.